For some reason the Bonjour installed with CS2/CS3 can have the unintended effect of making your network connection look like two network connections and actually disconnecting you from the network. I’m not clear on how it works, but it’s trying to help you out by looking for machines around you running Version Cue. However, somehow it ends up making your default gateway 0.0.0.0 which doesn’t work at all. If this happens to you, you can remove Bonjour pretty simply if you don’t need it. There are many times working with an enterprise network, when it’s beneficial or necessary to make a shortcut to a netowrk resource on your desktop. Common examples of this would be a shortcut to a lab folder or a shared application like Prism. 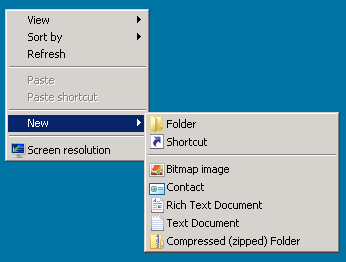 Create a new link on your desktop by right-clicking an empty spot and then choose new, then shortcut. If it’s a software program that you have shared access for it will look similar except that the shortcut should include the name of the program as well. When you see links like this, don’t cut and paste them to get to them. This will result in trying to download the file instead of opening the program. That doesn’t work. Instead follow the instructions to make a shortcut and either type or copy and paste that address into the location box. After you hit next, it asks for a name for the shortcut, which you can leave alone unless you have a name that works better for you. Note for Prism: in the above example you need to remove the number 5 from the address to connect to the actual file. Also, when you run the file for the first time, you may be asked if the program can update your registry. You do want it to make the change.